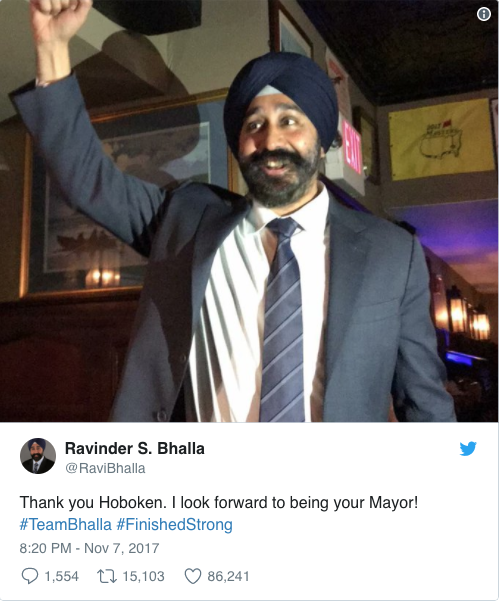 While there were many surprises during this Nov. 2017 election cycle, Ravi Bhalla made history by becoming the first Sikh mayor of Hoboken, New Jersey, The Washington Post reports. According to CBSNews, Bhalla ran against five other opponents for the office of mayor. Bhalla had served on the city council for two terms before running for mayor. Bhalla is respected by the Hoboken community, and the former mayor of Hoboken, Dawn Zimmer, endorsed Bhalla for mayor. Even with the success and respect he has in the city, he was not immune to public racist attacks. The Washington Post reported that towards the end of the 6-way mayoral race, some individuals ran ad campaigns attacking Bhalla due to his religious beliefs. Days before the election, individuals distributed fliers against Bhallla, saying, “Don’t let terrorism take over our town” with a picture of Bhalla in his turban. According to CBSNews, the flier labeled him as a terrorist. Bhalla is a Sikh, a member of a 500-year-old monotheistic Indian religion that is not related to Islam or Hinduism, according to the New York Times. However, since 9/11, many people in America have attacked Muslim Americans and Sikh Americans in “retaliation” for the attack. According to the Independent, people confuse Muslims and Sikhs due to the turbans they wear. Sikhs wear turbans as a commitment to their faith, according to the Guardian. The turban does not represent terrorism. According to NPR, there are around 200,000 Sikhs living in the U.S. and 60 percent of U.S. citizens admitted to not knowing anything about Sikhs. Simran Jeet Singh, a religion fellow at the Sikh Coalition, told the Washington Post that this vote is a large step forward in helping Americans learn more about Sikhs. While Bhalla is proud of his faith, the New York Times reports, he is mayor for all of Hoboken and plans to serve them equally. His term begins Jan. 1.